Times of the Islands – Worth Working For! Corporate incentive groups are a growing market in the Islands. You’ve worked hard all year for your company and have reached your sales target to qualify for a reward from your employer. Your “thank you” gift? How about an all-expenses-paid trip for you and your spouse to the beautiful Turks & Caicos Islands! Sound too good to be true? Well, not for thousands of visitors that have graced these beautiful shores over the past several years. Corporate Incentive Groups are a fast-growing segment of the tourist population, especially in Providenciales, as 2012 and 2013 saw unprecedented numbers of such visitors. One financial services company alone sent over 1,000 people to the TCI over a six week period! What do these companies look for when scouting destinations for incentive groups? • Air lift — Thanks to our geographic location and direct flights daily from Miami, Charlotte, New York and Atlanta, the Turks & Caicos Islands easily meets this need. Things will only get better when the extensive remodeling of the airport terminal is complete by Winter 2014! The luxurious Regent Palms resort is the perfect place to pamper corporate guests. • High-end accommodations — Such elegant, upscale and service-oriented resorts as The Regent Palms, Grace Bay Club, Gansevoort Turks + Caicos, Seven Stars, Beach House, and the new Blue Haven Resort & Marina give potential groups plenty of options in this department. Groups of up to 160 can enjoy luxury accommodations in an intimate setting on Grace Bay. 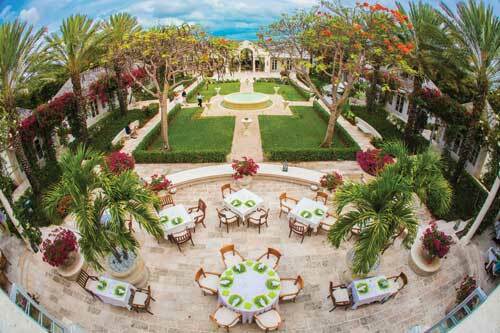 • Dining options — It is no secret that we have an abundance of fabulous restaurants in Providenciales. Everything from five-star extravagance to barefoot, off-the-beach casual can be found here, including a variety of Caribbean fusion, ethnic and native dishes. You name it, we’ve got it! • Activities — Favourites among incentive groups include sailing, snorkeling, diving, horseback riding, golf, and of course, enjoying the country’s amazing selection of world-class spas! Shopping is not left out and guests enjoy both the high-end stores and local cultural markets that Providenciales has to offer. • Excellent service — Guests on these trips are used to the best of the best when it comes to customer service. Providenciales is fast gaining a reputation for its friendly service with businesses that welcome guests and understand their needs. Stargazer Villa offers a spectacular venue for a gala dinner. Typically, corporate incentive trips last four to five days. The group arrives to a warm welcome at the airport and spends the first night enjoying a group dinner at their resort. Sometimes morning business meetings are required for the employees. The Messel Ballroom at The Regent Palms, meeting room at Gansevoort Turks + Caicos and the new conference center at Blue Haven Resort & Marina all give air-conditioned options for the meeting. At the same time, spouses enjoy a few hours to relax and enjoy the beach or pool. Most groups have a day of leisure time and individual activities and often a group activity is planned for another day. A favorite group activity that Nila DMC likes to offer is called the “Ultimate Getaway.” Guests are picked up by catamarans on the beach in front of their resort. 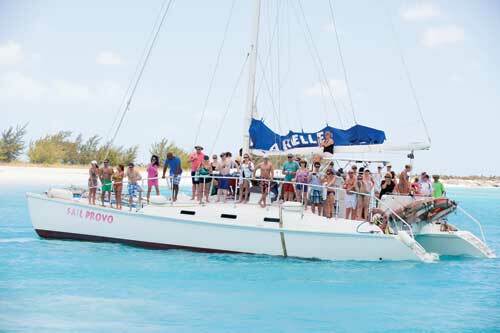 After a snorkel stop on the reef, they sail over to Half Moon Bay, where they are greeted by smiling servers offering ice cold beer and rum punch. A BBQ lunch is served and a live band entertains guest for the duration of their trip. Some people explore Little Water Cay in search of rock iguanas, while most choose to lay back, relax and enjoy the incredible views. For one evening, guests are typically split into smaller groups and dine at various restaurants around the island. The short transfer times between resorts and dining options are appealing, as no restaurant is more than a ten-minute drive away. 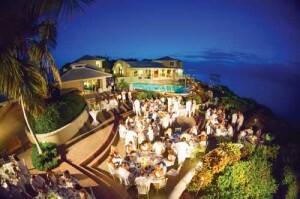 Usually the group also enjoys a “gala” evening, either at their resort or at a spectacular private villa. Group enjoying a sail and picnic at Half Moon Bay. NILA makes sure that all of the elements of the program are looked after, coordinating transportation, entertainment, décor, activities and catering. Knowledgeable staff are always on hand at the group’s hospitality desk, ready to offer advice on where to eat and what to do, as well as offer general island information. Guests are frequently surprised by the standard and quality of all the elements of their trip — these little islands have a lot to offer! The trip comes to an end as guests reluctantly load their suitcases and rested bodies into their transportation to the airport, talking about the fabulous time they’ve had and already planning their next vacation to the Turks & Caicos Islands! • Turks & Caicos is best suited for smaller groups. Perfect for high-end, exclusive groups of up to 160 guests. • Plan your program for off season to maximize your budget. From Christmas to Easter is peak season, meaning hotel availability is limited and prices are at the highest. If possible, try to book outside these months. Avoid September and October as many restaurants and businesses shut down. • Sunday and Monday are not the best days for your dine–around as many restaurants are closed. To maximize your dining options, plan for Tuesday through Saturday. • Avoid arriving or departing on a Saturday if possible. Even though we are looking forward to vast improvements at the Providenciales International Airport, Saturday is the busiest travel day of the week and wait times can be long. • Use a destination management company. Your planning process will be much less stressful if you hire a reputable local DMC to help you. Be sure to choose a company that is located in TCI — they know the Islands and the vendors, and are here to represent your best interests.